Expert tip: This is one of the most popular yoga retreats offered in Jamaica. Transform your paradigm in 10 days. If living from the truth of your heart, authentically, fearlessly, and abundantly speaks to you, this retreat is the one. An extension to the 8 Days Reset, the Complete Reset Retreat, this retreat also offers Oneness Wellness Farm's transformational journey through the chakras, with a few more days to integrate it all. Guided by the wisdom of the numbers, 1 - 10 gives you a very solid and complete foundation of practice and understanding, making this retreat very healing and empowering. Oneness Wellness Farm is a magnificent space giving a sense of calm, peace, and well-being by just being there. The inside is as beautiful as the outside; the rooms are simply and nicely decorated, offering a serene feel and vibe throughout. Hammocks, swings, day beds, quiet spots, and amazing views are all there to be enjoyed. The farm is abundant with a variety of fruits and vegetables, coconut trees, and many of the Jamaican healing herbs, so most of what you will eat and drink is made with products from the land, fresh, local, and organic. You will enjoy an excursion to Reach waterfall. Mangaljot is a self-made wise woman, a survivor, and a healer who has been teaching yoga and meditation for nearly 20 years. 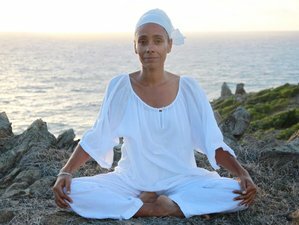 Born in Paris, she lived and taught in London for many years before moving to Jamaica and setting up Oneness Wellness Farm. Mangaljot loves to explain, help you understand, and connect the dots. She shares healing and empowering tools to anyone who wants to reset and step up their lives. An expert on chakras (your power points), the breath, the mind, self-realization, and relationships, spending time in her company is totally inspiring and life-changing. This retreat will take place at Oneness Wellness Farm, Portland, Jamaica, a space created for you. Also known as the place to reset, it's perfect to bring you back to balance! Most of Jamaica is mountainous, the mountains are covered in thick forests surrounded by flat coastal plains. Fast-flowing rivers form waterfalls as they tumble down mountain slopes. Portland is still very much a natural untouched paradise representing a more rural and authentic experience of Jamaica and its people. On the East coast of the island, jthere are the Reach Falls, Blue Lagoon, Rio Grande Valley, Somerset Falls, Zion Hill, Non Such Caves, and more. The coastline is studded with beautiful beaches each having their charm and all within close proximity: French Man’s Cove, Winefred, SanSan, Boston Bay, and Long Bay one mile white sand beach. Enjoy organic farm to table healthy eating experience, perfect for a natural detox or weight loss. Even non-vegetarians love this delicious cooking offering wholesome meals for your nourishment, enjoyment, and delight. A different beach for each day, Reach waterfalls (included in your retreat), Somerset falls, bamboo rafting on the Rio Grande, book a massage, surfing lessons at Boston Bay, diving, bush walking, boat rides, golfing, bird watching, whatever you're into, you will find something fun for you to do. Massages can be arranged, let us know when you book so we can reserve a massage therapist. Please book your flight to arrive at Kingston Norman Marley Airport (KIN). You may also book your flight to arrive at Sangster International Airport (MBJ) in Montego. Transfers from these airports are available on request for about 150 USD from Kingston Norman Marley Airport (KIN) and 250 USD from Sangster International Airport (MBJ) in Montego. The cost can be split by half or more when sharing transport with others. Oneness Wellness Farm is situated in the heart of Portland, on the East coast of Jamaica. Access is good, the roads have a few potholes but that’s Jamaica, you just need to take your time if you’re driving yourself. Other ways to get from the airport to Oneness Wellness in the Knutsford Express service which offers a luxury transportation service with air conditioning and Wi-Fi from Montego Bay to Port Antonio via Ocho Rios, and from Kingston via Junction to Port Antonio. You can be picked up at The Errol Flynn Marina in Port Antonio and costs between 15 and 20 USD. You may also rent a car if you want, but it’s not a necessity, there is easy access to Port Antonio the local town, beaches, and other tourist attractions. Route taxis are easily available before night, simply hail up vehicles with red plates. Airport: Norman Manley International Airport Airport transfer available: Norman Manley International Airport (US$150 per person) Additional charges may apply. You can request this in the next step. Airport: Sangster International Airport Airport transfer available: Sangster International Airport (US$250 per person) Additional charges may apply. You can request this in the next step. Oneness Wellness Farm is a space for balance and transformation where you can relax, recharge, and totally reset. Available every month with arrivals at the last day of the month before.